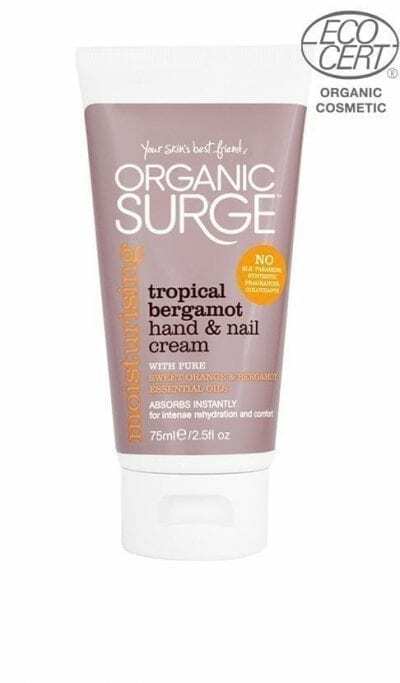 Tropical Bergamot Hand & Nail Cream 75mlFor all skin types Tropical Bergamot Hand & Nail Cream has an intensive moisturising action and is quickly-absorbed to provide comfort and hydration. It works to prevent moisture loss to leave hands softened and rejuvenated. Why we love it:Natural and organic hand and nail creamUntouched by harsh chemicalsEnriched with organic lavender and geranium essential oilsIntensively moisturises and nourishesComforting, quickly absorbed creamNaturally skin conditioning, combats dryness and irritationAnimal-friendly, suitable for vegetarians and vegansHow To Use:Massage into hands and nails as needed, breathing in the organic essential oil fragrance blend.